My friend Val is on Wheel of Fortune tonight!! HOW EXCITING!! 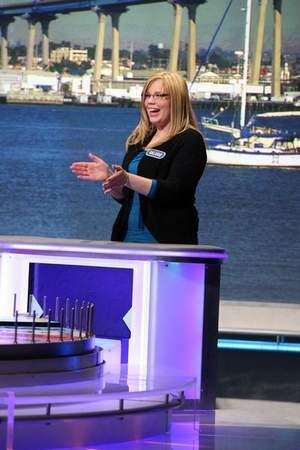 Valarie Marriott of Brockport will compete on Wheel of Fortune during a taped show that airs at 7 p.m. Tuesday (Feb. 7) on WROC-TV (DT 8.1). It’s Military Spouses Week on the show, and Marriott’s husband, Joshua, is an optic technician in the Marine Corps. She recently moved back to Brockport from Camp Pendleton in California after the family learned that her husband will be deployed to Afghanistan. The couple wanted her to be close to family who can help take care of their two daughters.